Some cigars look impressive. This was my thought when I purchased the Casa Magna Magnus II Limited. I was scanning the humidor at the Lone Wolf Cigar Lounge in West Los Angeles looking for a new cigar to review. 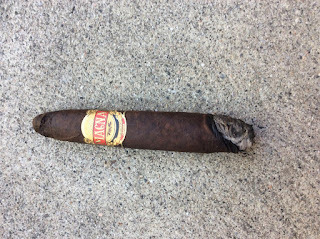 I have tried several Casa Magna smokes before but it has been many years since my last taste. As I stated earlier I thought very highly of the look of the cigar. Dark chocolate wrapper with a band that creates a real eye grabber. Solid, no soft spots, with an oily feel to the touch. Small veins with no discernible flaws. Overall it was a very bold looking cigar. The initial flavor had a combo of chocolate, coffee and a hint of maple. I was not expecting this as I was looking for spice and pepper. Yet, it was a strong taste and pretty bold but not overpowering. The aroma was pleasant, nutty and sweet. The burn was uneven with a dark ash and cool burn. Flavor stayed on course with the same profile I started out with. More spice and pepper flowed through but I liked the overall mix of the blend. No relights but needed to make a correction to even out the smoke. This was a tale of two different cigars. The construction looked very solid. The flavor profile was good but also had bouts of bitter and harsh notes. It was a respectable smoke but hoped for more. 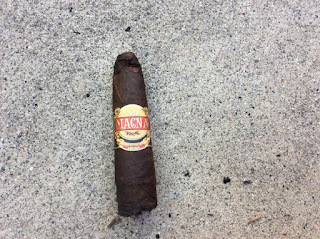 At $12.95 it needed to be the “bomb.” Too many issues to rate it as a must have cigar. Here are the numbers. Super Bowl or Super Cigar?